Early winter mornings often are blessed with three suns; the true sun and two false suns located on the sun’s left and right. The bright spots are referred to as Sun Dogs or Phantom Suns. The scientific word for this natural phenomenon is parahelion (plural – parhelia) which originates from Greek and means “beside the sun”. Sun Dogs are created when sunlight refracts off thousands of plate-like, hexagonal ice crystals floating in high, cold cirrus or cirrostratus clouds. Thinking back to science class you may recall how light ‘bends’ after passing through a prism. 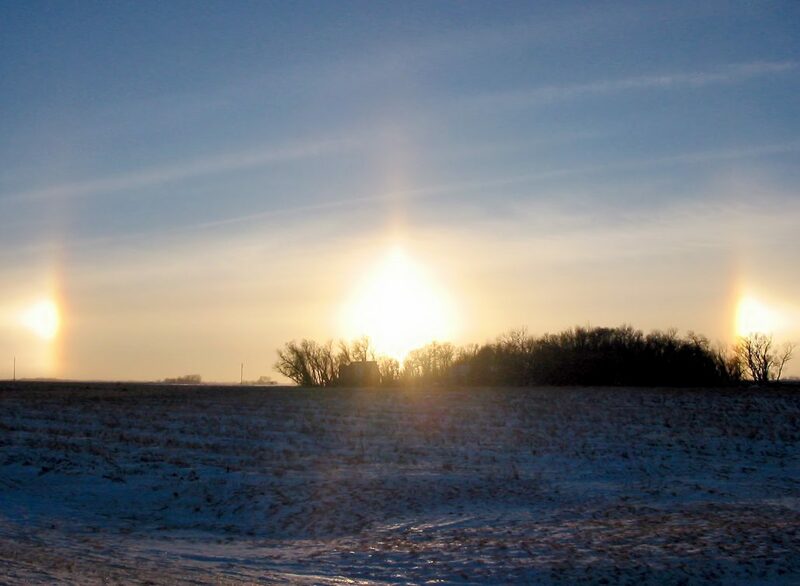 Sun Dogs are commonly observed when the sun is low in the sky on a chilly morning, but in perfect conditions the Sun Dogs will follow the real sun up into the sky, like a dog following its master. The orientation of the ice crystals determines whether or not a Sun Dog will appear. When the ice crystals are aligned randomly in the air, the refracted light forms a glowing ring around the sun called a Halo. As the ice crystals fall downwards through the air they align horizontally and the refracted light forms Sun Dogs. During very cold weather, such as we’re feeling lately, the ice crystals drift through low level air creating Diamond Dust which also refracts the sun’s light. Believe it or not, even a bright moon will have a similar effect, forming false moons called Moon Dogs or paraselenae.